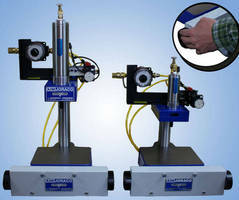 Benchtop Pneumatic Press suits small-scale applications. Weighing ~60 lb, DIRECT-AIRE Mini features straight pneumatic cylinder for applications requiring full force over the entire stroke. EZ-Dial pressure regulator, adjustable dwell timer, adjustable shut height, and 2-hand anti-tie down Actuator are all standard features. Suitable for manual and semi-automatic assembly operations, press provides 50-300 lb of constant force and is offered with optional custom stroke and/or open heights. AIM JORACO®, a leader in the pneumatic press industry, introduces the DIRECT-AIRE Mini as an even more compact version of their DIRECT-AIRE Benchtop press product line. Smithfield, RI - AIM JORACO®, a premier manufacturer of pneumatic presses is now manufacturing a modified version of their DIRECT-AIRE press line, the DIRECT-AIRE Mini. At approximately 60 lbs., the DIRECT-AIRE Mini weighs even less than AIM JORACO's standard benchtop units and includes unique features that make it an attractive choice for many small-scale applications. The AIM JORACO® DIRECT-AIRE and DIRECT-AIRE Mini presses both feature a straight pneumatic cylinder for applications requiring full force over the entire stroke. The DIRECT-AIRE Mini is offered standard with an EZ-Dial pressure regulator, adjustable dwell timer, adjustable shut height and 2-hand anti-tie down Actuator. Suitable for a wide range of manual and semi-automatic assembly operations, the DIRECT-AIRE Mini provides 50 - 300 pounds of constant force and is offered with optional custom stroke and/or open heights. AIM JORACO® compact, benchtop air presses are now available with forces from 30 lbs. to over 16 tons. Technical support engineers are available to discuss application requirements in an effort to ensure their customers are provided the best solution for each unique project. 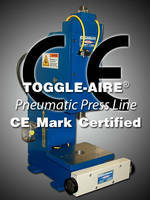 All presses can be made-to-order, with standard and custom options available. Die sets and tooling can also be quoted upon request, with most requests answered the same day they are received. About AIM JORACO AIM JORACO® manufactures the TOGGLE-AIRE® line of precision pneumatic & manual toggle presses, semiautomatic rotary indexing machines, and assembly and fabrication tooling. AIM JORACO® has over 60 years experience in providing quality presses that meet a wide range of special requirements and a reputation for extending superior customer service. 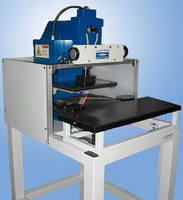 Sample testing is free-of-charge and die sets, tooling and complete engineering support is available upon request. All equipment is manufactured and shipped from their Smithfield, RI facility - MADE IN THE USA! 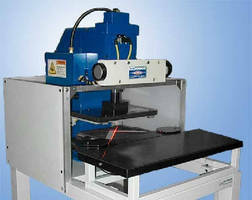 For more information, please visit: www.joraco.com, call us at 401-232-1710 or email: sales@joraco.com.